Home » Welcome to October Unprocessed 2018! Welcome to October Unprocessed 2018! Way back in October of 2009, I was struck by a simple idea: What would happen if I went for an entire month without eating any processed foods? Scroll down or click here! This question would have been laughable (or even nonsensical) just a few decades ago. Nowadays, it seems that almost every food that comes with an ingredients list on it is likely to be laden with extra sugar, fat, and salt. And preservatives. And flavorings. And artificial colors. So I tried it, along with a few good friends: A month of no processed foods. It was revelatory. My expectations and sense of taste were re-calibrated. I started to identify individual ingredients in the foods I ate. I didn’t crave those salty snacks. I found myself often in the kitchen, excited to see what I could cook next. Above all, I simply felt better. We took turns hosting small dinner parties, and shared our stories and experiences. It brought us closer together. Funny how real food does that. In 2010, I decided to try it again, in a bigger way. I had started Eating Rules just a few months before, and I reached out to my fellow foodies, bloggers, and friends, and issued the challenge again. By the end of October, 415 people took the pledge and got this movement really started. We’ve grown each year since then — by now, more than 30,000 people have joined in. We’ve also shared a ton of great posts each year, and this year will be no exception. Although it’s a lot of work to make this project happen, I want to do it again. It’s just too important not to. And I want to share this experience with as many people as possible. Not just my experience, but our experience. Together, let’s see how many people we can get to eat no processed foods whatsoever during the month of October. And then let’s see what happens. Unprocessed food is any food that could be made by a person with reasonable skill in a home kitchen with whole-food ingredients. I call it “The Kitchen Test.” If you pick up something with a label (if it doesn’t have a label, it’s probably unprocessed), and find an ingredient you’d never use in your kitchen and couldn’t possibly make yourself from the whole form, it’s processed. It doesn’t mean you actually have to make it yourself, it just means that for it to be considered “unprocessed” that you could, in theory, do so. New for 2018: Set Yourself up for Unprocessed Success! 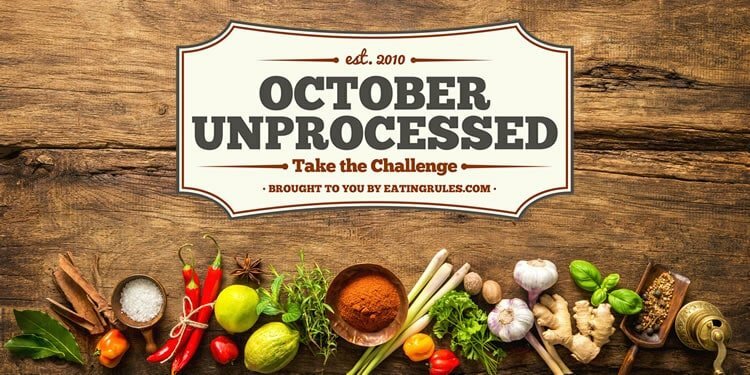 The October Unprocessed Challenge is totally free — but if you want a complete plan for unprocessed success for the next four weeks (and beyond), check out my new Real Food Rescue program! Filled with guidance, strategies, printable checklists & worksheets, dozens of recipes, and meal plans — this is the easiest way to have all the best resources and guidance at your disposal, helping you take control of what you eat, feel great, and transform your life. Commit to eating no processed foods during the month of October by signing your name below. This is an exercise in awareness. If an entire month is too much of a commitment, that’s okay. Maybe it’s only a week? Maybe just a day? Sign the pledge, and show your support! Maybe you’re not comfortable with my definition of “unprocessed.” That’s okay, too. Decide what it means to you and take the pledge on your terms. Need an exception? Sure, no problem. Just make sure it’s a deliberate choice, not just because of a habit. Whatever your level of commitment (even if it’s for just one day, please sign the pledge), and discover how it changes you, your family, your community, and the world. 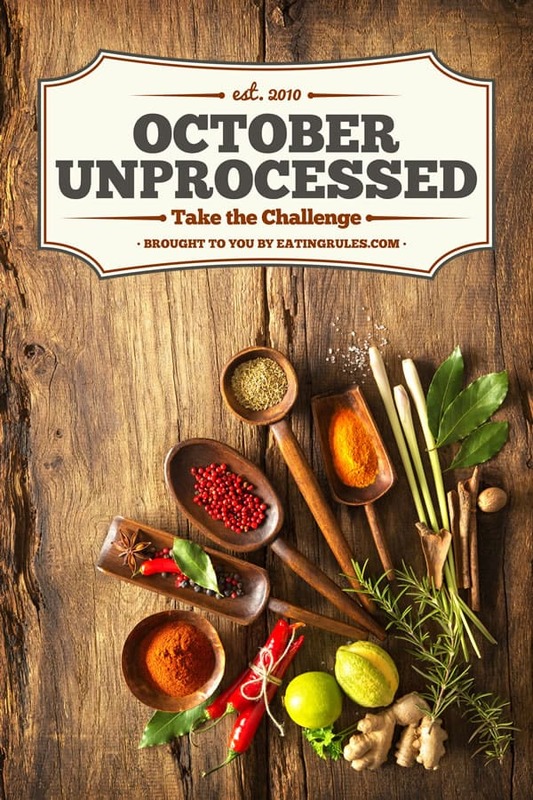 Take the October Unprocessed Pledge Here! If you don’t see the pledge form, please try this page instead. By taking the pledge you’ll also receive new blog posts by email; you can unsubscribe anytime–no hard feelings! Of course, your email address will never be shared or displayed publicly. Keith Antelope, Ca. Staying away from soda. Debbie Richmond, VA 3rd time is the charm! John Jersey Lets do this! Karla Los Angeles 1st time!!! Aimee New York, NY Year 5! View and search the list of all 1369 awesome people! You can leave a comment below, but if you want to take the pledge, please fill out the form above! Kind of makes me feel proud. Apparently people find it hard to do , what I do every day. Cooking with simple ingredients. Good luck! Thanks the average person myself included eats so many processed foods without a second thought. And to walk away from them are hard especially with children processed foods are easy to grab and appeal a great deal to tiny people. Fat is not bad for you in moderation. In fact, fats are needed as part of a healthy diet. We need to educate people better about fats and what they are and how they are needed. I have had a great deal of physical problems, and a doctor actually caused me diabetes, so I try harder to eat healthier, but I’ve always started with wholesome, unprossed goods, which I cook from scratch, no boxed refuse for my family. Looking forward to creating delicious whole-grain meals with fresh in season produce! I love Bob’s Red Mill, and I love knowing what is in all the food I eat! Can’t wait to meet some of you in person at the Natural Products Expo in Baltimore the end of September!